Enzymes provide many of the same benefits as chemical dough improvers, but can provide a clean label option. Dough improvers include reducing agents (e.g., L-cysteine and metabisulfite) which increase extensibility and oxidizing agents (e.g., azodicarbonamide and potassium bromate) which increase dough strength and gas retention. 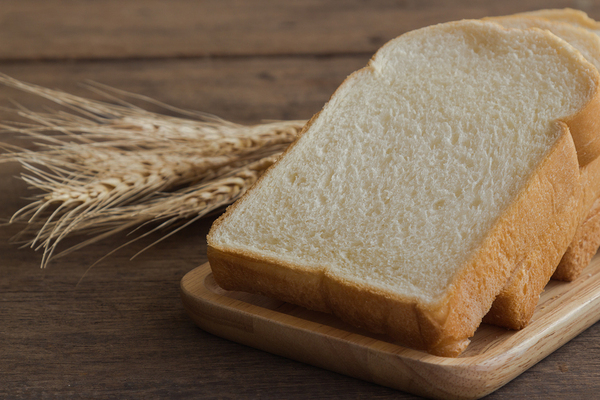 Emulsifiers are another type of dough improver and can keep bread soft over time (e.g., monoglycerides) or increase dough strength which allows the dough to survive the mechanical abuse of processing (e.g., DATEM). Sodium stearoyl lactylate (SSL) is an emulsifier that has both anti-staling and dough strengthening properties. Another category of dough improvers is enzymes. Enzymes provide many of the same benefits as chemical dough improvers but can provide a clean label option. Often, enzymes are denatured during the baking process and as processing aids, don’t need to be labeled in the finished product.4 For those that are labeled, the ingredient names are usually shorter and more appealing than those of their chemical counterparts. Enzymes used as dough improvers work by breaking down some component of the dough such as starch, fiber, protein, or lipids. Most of these enzymes are made through microbial fermentation, either bacterial or fungal. Unlike chemical dough improvers, most enzymes require consistent conditions with good understanding and control of time, temperature, and pH. Opportunities exist for enzyme use in other baked goods such as cakes, muffins, tortillas, and pizza crusts. Other enzymes are available for baking such as phospholipases, oxidases, and xylanases and, in fact, it’s very common to use blends. This helps achieve the best finished product for the current processing conditions. Opportunities exist for enzyme use in other baked goods as well such as cakes, muffins, pizza crusts, and tortillas.10 Click to see our complete Bakery Ingredient product line. 1. R. Carl Hoseney, Principles of Cereal Science and Technology, 2nd ed. (St. Paul: American Association of Cereal Chemists, 1998), 230. 2. R. Carl Hoseney, Principles of Cereal Science and Technology, 2nd ed. (St. Paul: American Association of Cereal Chemists, 1998), 230. 3. Lin Carson, “Dough Conditioners,” BAKERpedia.com, http://bakerpedia.com/ingredients/dough-conditioners/# (accessed September 28, 2017). 4. Donna Berry, “Exact Tools,” BakingBusiness.com, November 1, 2010, http://www.bakingbusiness.com/News/News-Home/Features/2010/11/Enzymes.aspx?cck=1 (accessed September 28, 2017). 5. K. Kulp, “Enzymes as dough improvers,” in Advances in Baking Technology, eds. Basil S. Kamel and Clyde E. Stauffer (New York: Springer, 1993), 152-165. 6. K. Kulp, “Enzymes as dough improvers,” in Advances in Baking Technology, eds. Basil S. Kamel and Clyde E. Stauffer (New York: Springer, 1993), 152-165. 7. Donna Berry, “Exact Tools,” BakingBusiness.com, November 1, 2010, http://www.bakingbusiness.com/News/News-Home/Features/2010/11/Enzymes.aspx?cck=1 (accessed September 28, 2017). 8. Donna Berry, “Exact Tools,” BakingBusiness.com, November 1, 2010, http://www.bakingbusiness.com/News/News-Home/Features/2010/11/Enzymes.aspx?cck=1 (accessed September 28, 2017). 9. K. Kulp, “Enzymes as dough improvers,” in Advances in Baking Technology, eds. Basil S. Kamel and Clyde E. Stauffer (New York: Springer, 1993), 170-72. 10. Donna Berry, “Exact Tools,” BakingBusiness.com, November 1, 2010, http://www.bakingbusiness.com/News/News-Home/Features/2010/11/Enzymes.aspx?cck=1 (accessed September 28, 2017).